Raise your hands…. who here has (consciously) been through an earthquake. Okay, one that really shook the place – not one that is reported two days later and you say, “oh, yeah”, but one that you know you’re in an earthquake. Things are popping, shaking, and rattling. Okay, so quite a few of you. One moment, everything in the world is fine, the birds are singing, the sky is blue, the ground is solid. The next moment, the very ground that was solid before is shaking and moving violently, taking away all perception of normalcy. For seemingly endless moments, there is no safe haven. Pretty nerve racking isn’t it? No, actually outright terrifying, especially if you are near the epicenter. An earthquake…. What exactly is an earthquake? Since I’m not a geologist, seismologist, don’t have any sort of degree with ologist in it, I will shy away from trying to sound like some sort of ologist. I will, however, do research on the subject and will try to provide you with as much detail in layman’s terms for all of us to understand. Understanding is what helps us prepare, which is what helps us survive. And surviving is just the start after a major earthquake. To further break it down, earthquakes are generally produced one of two ways: either by tectonic plate / fault stress release or by vibrations caused directly by volcanic activity. For the purpose of this blog, we’ll focus in on earthquakes caused by tectonic plate activity or fault activity. Up until the 1960’s, scientists had an idea that all of the continents at one time or another were closely connected to one another because of the similarities in their puzzle shape likenesses. The realization that all of the continents had eerily similar outlines was made by 20th century geologist Alfred Wegenar. He had a hunch that they all were connected by more than coincidence, but he could not establish how or why. It wasn’t until the 1960’s that scientists started theorizing about plate tectonics. With the advent of better technology throughout the 1960’s and 70’s, scientists’ understanding of plate techtonics and their movement improved. With satellite mapping capabilities of the 80’s and 90’s and the advent of GPS in the 90’s and beyond, the ability to measure, monitor, and study tectonic plates of the earth has constantly improved. With current technology, we’re able to accurately map the entire surface of the planet, both above water, and below. What has been discovered is truly amazing. The earths outermost layer, the lithosphere, is made up of numerous independently moving plates, some of which, continents are permanently attached to their surface. Others are under water, and others are under a combination of both land mass, and water. These plates, float on another layer beneath them, called the athenosphere. Depending on who you talk to and what definition is being used to describe techtonic plates, there are either seven or eight major plates, with gaps in the lithosphere being filled with numerous smaller plates. The most seismically active region on earth (both seismically and volcanic) is what is known as the, “Ring of Fire”, the area surrounding the Pacific Ocean starting south of Japan, working north up past Korea, through the Bering Straight, along the Alaskan coast, down the coast lines of British Columbia, Western United States, down through Mexico and the South American Isthmus, and to the southern point of South America. Both of the worlds worst earthquakes of recent history have originated in the Ring of Fire; the 1964 Easter Sunday Quake in Alaska and the 1960 earthquake in Chile, magnitude 9.2 and 9.5 respectively. There are three different types of boundaries between the plates: Convergent; Divergent; and, Transform. These boundaries are determined by their relative motion. Earthquakes, volcanic activity, building of mountains, and underwater trench formation all occur at these boundaries. A divergent boundary – or constructive boundary, is where two tectonic plates are moving away from each other. The space between the two plates, as they separate, is filled with magma from below. An example would be the Mid-Atlantic Ridge, which is the boundary between the North American Plate and the Eurasian Tectonic Plate. A transform boundary is where two plates are sliding past each other. Probably the most well known transform boundary is the San Andreas Fault in California, where the North American Plate and the Pacific Plate meet. The North American Plate is moving southward, and the Pacific Plate is northbound. The infamous San Francisco earthquake of 1906, portions of the fault moved from as much as a couple of yards to a record setting twenty one feet. The fault currently moves – or creeps – at a rate of up to two inches per year. Convergent boundaries are an area where one plate if forced under another plate into the mantle in a process known as subduction. Those of us here in the Pacific Northwest are becoming more and more versed in the Cascadia Subduction Zone, where the small Juan de Fuca plate is being forced under the North American Plate. In subduction, as one plate is forced under another, pressure and stress build over a period spanning from hundreds of years to possibly as much as thousands of years. As the pressure from subduction increases, stresses continue to build to a point where the overlying plate can no longer maintain the level of stress that has developed, and, like flicking your forefinger from your thumb, releases the pressure in what is called up lift. The level of pressure that has developed will dictate the intensity of the up lift. As the up lift releases, vibrations create seismic waves, known as body waves, the severity of which again are dictated by the amount of stress, pressure, and up lift. A nasty bi-product of this type of earthquake, when the subduction zone is located under water, is a tsunami. The December 2004 Indian Ocean earthquake and resulting tsunami that killed over 230,000 people in fourteen countries was the result of a megathrust earthquake where the Indian Plate was subducted by the Burma Plate. The shaking of the earth is created through ‘earthquake waves’, from which energy, which has been building in stressed rock, radiates when a fault breaks or slips, relieving the stresses that have developed over time. The strength of the shaking of the ground is measured several categories: velocity of ground motion; the acceleration of ground motion; the frequency content of the shaking, and how long the shaking continues, or the duration. These are known as ‘body waves’. There are two basic types of body waves that are created by an earthquake: ‘P’ or Primary waves; and, ‘S’ or Secondary waves. S waves on the other hand, are very destructive, deforming the ground as they travel, perpendicular to their direction of travel. 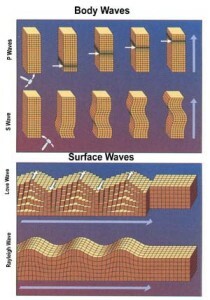 Unlike P waves, S waves are partial to the material they are flowing through; they do not travel through liquids or air. When S waves do shake the ground, they create deformations of the ground, caused by shear and lateral forces – back and forth forces, on structures. Older buildings that have not been seismically retrofited or updated do not respond positively to S waves. In fact, they usually sustain massive damage or total destruction from strong lateral forces caused by an earthquake. Here is an interesting demonstration of how both ‘P’ and ‘S’ waves work in different types of environments. Some believe that animals can sense the presence of P waves and start acting out of character – in some cases, it has been recorded that animals actually fled for the proverbial hills hours or minutes prior to an earthquake striking a region. When P waves and S waves reach the earth’s surface, part of their energy is trapped by the earth’s surface and their direction is dictated by the surface. These become known as surface waves, of which there are two distinct types: Love Waves and Rayleigh Waves. Unfortunately, I don’t have an animation for Love waves, so I will try to paint a picture. Looking at the Rayleigh wave animation above, try to visualize sharp upward motions instead of slow rolling motions. Then add violent side to side motions between the peaks of the Love waves. 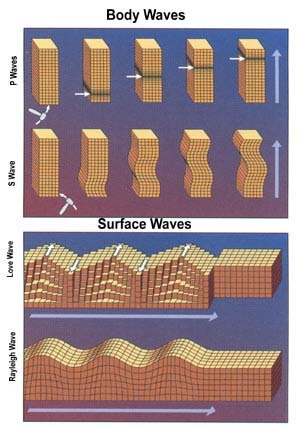 Love waves and Rayleigh waves are by far the most destructive as they move along the surface of the earth. Love waves and Rayleigh waves can last for several minutes. The amplitude of an earthquakes energy is directly transferred into the Love and Rayleigh waves. The higher the amplitude, the greater destructive power of the earthquake. The recent devastating earthquake that hit Nepal was an example of surface waves meting their destructive power. Images from NASA show that the quake changed parts of the topography of the hardest hit areas of Nepal. It’s a lot to absorb, but it is actually just barely a scratch on the surface (no pun intended) of the cavalcade of events that actually happen when an earthquake hits. I invite you to peruse through the Pacific Northwest Seismic Network (PNSN) website at www.pnsn.org and the USGS website at www.usgs.gov for more on everything seismic, volcanic, and preparations.